Dr. Irina Kunovskaya is The Financial Literacy Group’s Director of Research and is an internationally recognized expert on analytical and applied research in the fields of personal finance and economics. Dr. Kunovskaya’s financial literacy research has been used in support of policy formulation, program development and program evaluation. Prior to joining The Financial Literacy Group, Dr. Kunovskaya was a pioneer in the financial education movement in her native Russia. She was the founder and CEO of the National Foundation for Financial Literacy in Russia, an NGO dedicated to raising the level of financial literacy of Russians. In that role, Dr. Kunovskaya helped bring national focus to the issue of financial illiteracy. In recognition of her groundbreaking contributions to the development of financial education programs in Russia, she was selected to represent Russia at the G8 International Conference on Improving Financial Literacy in 2006. Two years later she received the Financial Pearl of Russia 2008 National Award. Dr. Kunoskaya’s accomplishments in Russia have attracted international attention from prestigious multi-lateral organizations. The World Bank selected her to draft a comprehensive study of financial literacy initiatives. She also received a fellowship from the American Councils for International Education to develop and implement financial literacy initiatives in Moscow. In addition to her role as a leader in the financial literacy movement, Dr. Kunovskaya has been a highly respected university professor of economics for twenty years. During that time she was honored by her students through her selection as an outstanding teacher and advisor. She was also honored by her academic peers through her selection to serve as Chair of the Department of Economics at two universities in Russia (Kabardino-Balkarian State University and Social Management Academy under the Government of Moscow Region). Prior to coming to the U.S., she worked as an Associate Professor at the leading Finance University under the Government of the Russian Federation. In addition to her university service, Dr. Kunovskaya has been consulted by businesses, NGOs and government agencies on issues related to housing finance and housing market development. She has been published numerous times on financial education, mortgage markets and housing finance in both Russian and English. 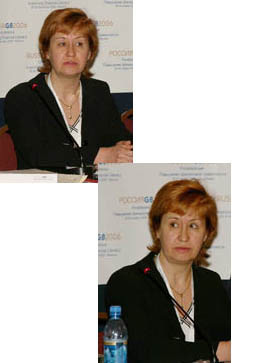 Dr. Kunovskaya holds a Ph.D. in economics from Moscow State Regional University and a Ph.D. in consumer economics from the University of Georgia.